Frustrated by your HR day job, but can’t afford to quit? Then discover how to earn a lucrative second income on the side. How? 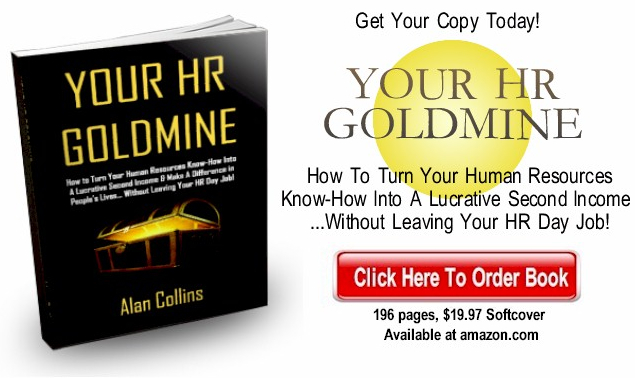 By tapping into your existing “goldmine” of HR experience and knowledge and leveraging it in a different way. Make no mistake about it: There’s a huge, huge demand for your HR know-how and plenty of people are willing and eager to pay you for it — no matter how much or little HR experience you already have. And hundreds of other topics! Do you know how to interview and select top job candidates? Have you successfully built and HR department starting from scratch? Do you know how to create effective compensation and incentive programs? Do you have a track record of negotiating favorable union labor contracts? Do you have experience with employee engagement surveys and how to maximize their use? Do you know the appropriate steps involved in making layoffs and downsizing the workforce? Have you created an effective orientation and on-boarding program for new hires? Have you trained employees and managers on effective coaching and performance appraisal techniques? If so, you can make money from this knowledge — without leaving the comfort of your current HR role. Frankly, the above are just a few examples. There are literally HUNDREDS more that clients will will pay handsomely for. The key is that you must know how to “package” up your HR expertise FAST…and in a way that others can access it, benefit from it and pay you for it. And in this book, you’ll learn exactly how to do it, step-by-step. The secret is by knowing how to write 20-25 page simple, small reports that address burning problems in HR that you have already solved — and then getting paid for them. That’s it. That’s exactly what this book will teach you how to do. There is absolutely no FASTER way of cashing in on your HR expertise than to capture it into a small special report that solves a pressing problem. Why writing 20-25 page reports on HR topics is the IDEAL way to cash in on your HR expertise…and how this approach allows you to get results in as quickly as 7 days. How to use this method to create a HUGE demand for your HR expertise, advice and know-how. Hint: All this comes from knowing how to market yourself and coming from a place of wanting to SERVE others by sharing your expertise to INSPIRE them and INSTRUCT them in areas you’ve mastered or taken for granted. How to execute all of this flawlessly without ever needing to jeopardize your day job in Human Resources. This includes doing things the “right way”…without compromising your ethics and without breaking any of your company’s policies, rules, employment agreements or conflict of interest concerns. How to use this approach to successfully package, price and position your HR know-how in the marketplace. This includes ways of setting yourself up as “one-of-a-kind” and the “go-to” person for your area in HR. By properly positioning yourself as ” different” than anyone else in Human Resources, you can stand out as attractive, desirable and unique. How to create your first report quickly and repeat this process over and over again to literally build a second income empire. How you can do all this a few hours a week on evenings or weekends in 7 days or less. Just simply follow the step-by-step plan laid out in this book. There’s nothing for you to figure out on your own. If you have a laptop, and a few hours a week, you’ve got everything you need to get started. Discover the secrets of finding the SPECIFIC NICHES in HUMAN RESOURCES that you know absolutely cold and can be successful with. This includes 157 red-hot topic ideas specifically for HR PROFESSIONALS that you can STEAL, use TODAY and profit from. This is a must-have if you’re absolutely clueless or stuck on how or where to get started. How you can turn as few as 20 pages of your HR know-how and advice into 9 different lucrative “products” that people are hungry for and will pay between $7 to $97 for. This will allow you to take “one piece” of your expertise, re-use it and potentially create multiple streams of income from it. Five (5) different “fill-in-the blank templates” you can use to compose and organize your HR knowledge, advice and experience super-FAST. “Packaging up” your know-how can be difficult and time-consuming if you don’t have these templates and models to follow which are provided in this book. 21 different ways you can compile and create awesome, highly desirable HR information–while doing very little work. And, if you’re willing to be just a little creative, you don’t have to do ANY of the work yourself or even be all that knowledgeable about your topic. An easy-to-follow step-by-step blueprint for promoting & building your second income empire in 7 days or less. This roadmap for success guides you every step of the way and eliminates the need for you to figure all this out on your own. How to set up and operate everything on AUTO-PILOT…so that you don’t have to lift a finger to generate extra income. This includes two different online resources that you can use to set up things so that they market for you, collect money, and deposit it in your bank account while you grind away at your HR day job, sleep, work out or watch TV. And there’s much, much more! In this book, absolutely nothing is held back. It is a complete, no B.S. “tell-all” book. You’ll learn the shortcuts, the secrets, what works, what doesn’t, and case examples of people who are doing this successfully. You’ll also get the inside story and CANDID CONFESSIONS outlining how I’ve done this myself that I’ve never shared with anyone before. Blueprint That Lays It All Out Step-by-Step! & former HR Vice President at Valco, Inc.
About the author: ALAN COLLINS is founder of Success in HR and author of two HR best-sellers, Unwritten HR Rules and Best Kept HR Secrets. He was formerly Vice President of Human Resources at PepsiCo where he led HR initiatives for their Quaker Oats, Gatorade and Tropicana businesses. He has been a featured speaker at HR conferences and seminars throughout the U.S. His articles have appeared in HR Executive, HRM Today, Linked:HR, and Personal Branding. 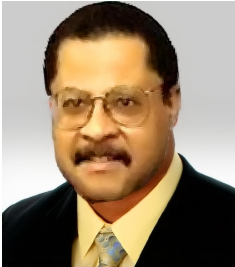 He helps HR professionals take their careers to the next level at SuccessInHR.com. With 25 years of corporate, field and executive experience in human resources, he earned his BS and MS degrees in Industrial Relations from Purdue. You can view his LinkedIn profile here.